A guide for students and instructors enrolled in online or off-campus classes. Students who are taking classes online or at the Grayslake campus can still have access to the many books held at the Rebecca Crown Library in River Forest. The videos and handouts below will show you how to locate and request items. This short video will show you how to find books at the Rebecca Crown Library using our online catalog. The accompanying handout provides printable instructions. This handout will show you how to find books in the library. This video will show you how to use the advanced search option to find books at the Rebecca Crown Library at Dominican University. You can also use advanced search to find books at other I-Share libraries. The accompanying handout provides printable instructions. This handout will show you how to find books at other Illinois universities. 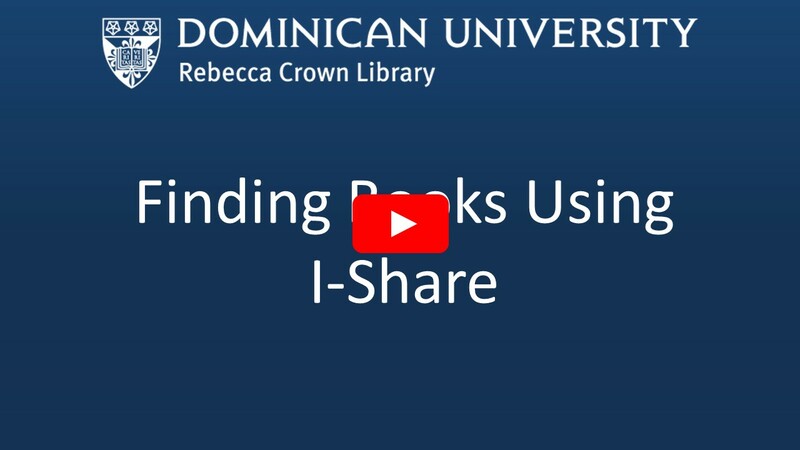 This video will show you how to create an I-Share account so that you an request books from other academic libraries in Illinois. This handout will show you how to create an I-Share account. You can use your I-Share account to request and check out books from other libraries. From this video you will learn how to access eBooks from the library. The accompanying handout provides printable instructions. This handout will show you how to find and access electronic books through the library webpage.